Your class action case has settled, now what? and wage & hour cases, many factors impact the notice and administration of a case including what’s happening in the world, the news cycle, the settlement benefit, evolving rules and guidelines, and more. This can be challenging for class action practitioners to navigate, especially attorneys who are new to the class action space. 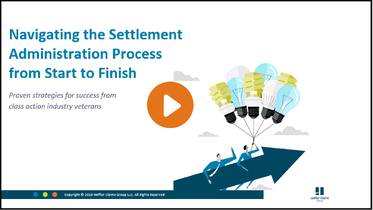 We created a start-to-finish round-up of considerations and proven strategies for success in a free on-demand webinar, Navigating the Settlement Administration Process from Start to Finish. During this presentation, Heffler team members and industry veterans, Ed Radetich, Dave Kaufman, and Lori Castaneda, provide key insights, proven strategies for success, and common misconceptions for each stage of the settlement administration process – from drafting the settlement agreement to obtaining final approval.